Charles Elam was born on 17th January 1895 at 96 Manor Road, Stoke Newington, the son of George and Ethel Elam. Charles' father - a physician and surgeon - had been born in Sheffield and the family returned to his native town at some point over the next few years. In September 1914, 19-year old Charles Elam was a Sheffield steelworker living with his parents in the city's Endcliffe Crescent. Left: Charles Elam. Photograph © IWM (HU 121680) and free to reuse for non-commercial purposes under the IWM Non Commercial Licence. Within a month of the declaration of war with Germany on 4th August 1914, Elam had applied for a commission in the Territorials. A matter of days later, recruiting began for a Sheffield City Battalion and - without waiting for his application to be processed - Elam formally joined the 12th Bn. York & Lancaster Regt. as a Private (12/1423) on 10th September. Elam's officer potential must have been evident, as just 8 days later he was appointed to a commission in the battalion with the rank of 2nd Lieutenant. Promotion to full Lieutenant followed on 5th December as the battalion moved to Redmires Camp. The attack on Serre by the Sheffield City Battalion on 1st July 1916 was fronted by two waves formed from "C" Company on the left and "A" Company - one platoon of which was led by Elam - on the right. 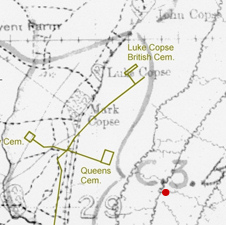 At 2.40am, it was reported to Battalion HQ in John Copse that "A" Company was in position for the attack, with the first wave occupying the front line trench and the second wave sheltered on the reverse slope between the front line and Copse Trench. At 7.20am, under the cover of an intense artillery and mortar bombardment, the first waves of "A" and "C" Companies clambered out of their trench and moved 100 yds into No Man's Land where the men lay down to wait for the bombardment to lift from the German front line. Minutes later, the second wave followed. At 7.30am, both waves - separated by some 30yds - advanced slowly in line towards the German wire. Despite a week-long bombardment, long stretches of barbed wire entanglements were still intact and many men were cut down by enemy fire as they desperately sought a way through. At the head of "A" Company, Captain William Spenceley Clark was killed by machine gun fire and left hanging on the wire. Elam found one of the few gaps and led a party through the wire into the German front line where they fought in vain to hold on to the hard-won ground. Elam never returned. Dr. George Elam first heard that his son was missing in a telegram delivered to the family home during the evening of 10th July. Almost 5 months later, 12/1172 Pte. S. Ardern related the eyewitness account of 12/119 Pte. H. Glossop (No. 4 Platoon, "A" Company) to an interviewer at 1st Northern General Hospital, Newcastle. Glossop had described how two bombing parties were working their way up communication trenches from the German front line. Glossop was ferrying supplies of grenades to the two parties, and at one point found Elam wounded in the neck. When he next returned, Elam had disappeared. It seems likely that Lt. Elam, fatally wounded, died in German hands, providing some explanation for his eventual burial several miles away from Serre in A.I.F. Burial Ground, Flers (Plot XII, Row M, Grave 2). 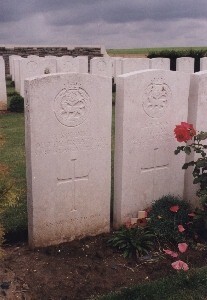 Left: Graves of Lt. Charles Elam and an unknown soldier of the York & Lancaster Regt. The Commonwealth War Graves Commission has recently made available online more than 300,000 documents relating to those who died in service during the First World War. Amongst these documents it is recorded that the bodies of both Elam and the unknown soldier were exhumed from a location (map reference 57D K29.b.4.1) close to the German second line of trenches. The red-coloured circle in the adjoining map shows where the bodies were found. Compiled from TNA document WO339/21709, "History of the 12th (Service) Battalion, York & Lancaster Regiment" by Richard Sparling (1920), "Sheffield City Battalion" by Ralph Gibson and Paul Oldfield (1988), CWGC records, the Quarterly Army List for June 1916, and the Sheffield Daily Telegraph of 10th and 11th July 1916.